Gift Certificate SoCalMotoGear.com - Professional Grade Motorcycle Lighting - Plug N Play Products - "Riding at night has never been brighter!" Gift giving made simple...It's the perfect gift! As the Sender, please let your Recipient know to check their email & junk/spam folders as the email may end up there. Please view the instructions below and include as much information as you can. 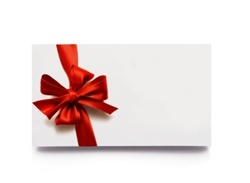 You can select the value of the Gift Certificated after you choose a delivery method. During checkout, you will need to fill in both the "Bill To" and "Ship To" address fields. In the Ship To address field, please enter the Recipients info if you have it. If not, you can enter your own information in the Ship To fields. Although the Ship To field is required,your selection of the Delivery Method (Email or Print) will be the way the certificate will be sent. If the Recipient has not received an email with the certificate number within 24hrs, please email us to advise: service@SoCalMotoGear.com.We can re-send the gift certificate email per your request. *Gift Certificates cannot be purchased with a coupon/coupon code/discount. Places the gift certificate in the shopping cart as you would any other product. Select electronic gift certificate to be delivered via email or a printed one. Next, the enter gift certificate details. When finished, the Sender can continue shopping or proceed to checkout.